In what was somewhat of an upset victory, the classy mare Pinker Pinker won the historic Cox Plate (Aus-I), the best weight for age race over 10 furlongs in Australasia, last night at Moonee Valley. 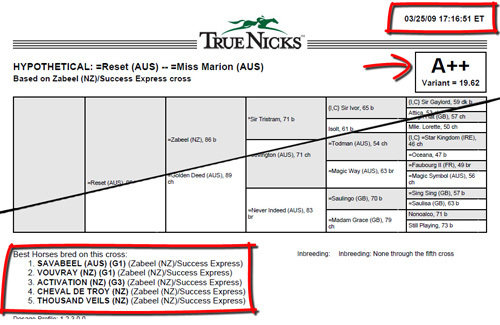 Interestingly, the owner of Pinker Pinker's dam Miss Marion had asked TrueNicks to run a Broodmare Analysis Report on the mare when Pinker Pinker was still an unnamed yearling. The analysis included Reset (AUS) (TrueNicks), the sire of Pinker Pinker, and that mating at that time was an A++, the second highest rating of the 50 stallion selections in the report. A notable success on the Zabeel/Success Express cross was the talented Savabeel (AUS) (TrueNicks), himself a Cox Plate winner in 2004. Subsequent to the report, Bill Giovas, the owner of Miss Marion, elected to send her to the third pick on the report, the champion Australian sire and new shuttle stallion Lonhro (AUS) (TrueNicks,SRO), but unfortunately she produced a dead foal. Miss Marion has recently produced a 2011 colt by Lonhro's group I-winning son Denman (AUS) (TrueNicks), and she will be bred back to Lonhro. Given Pinker Pinker's huge run last night, we thought this would be as good a time as any to illustrate how the Broodmare Analysis Report can be very useful in managing your broodmare's career and planning successful matings. 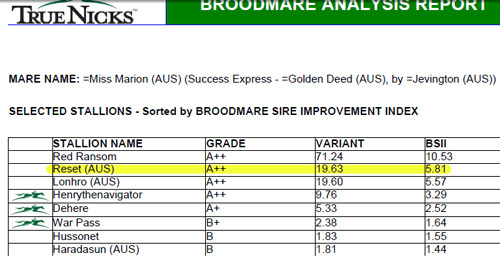 Click here to order your own Broodmare Analysis Report for your mare today, and check out screenshots from Miss Marion's report and the Cox Plate replay below.